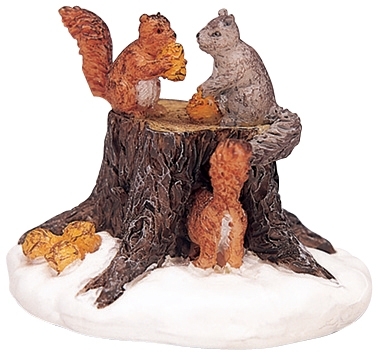 Lemax Chipmunks Figurine depicts a Winter scene of cheeky Chipmunks gathering around a tree stump in the Winter snow eating nuts. Suitably brings a nature piece to a Winter themed scene when placed amongst other woodland animals in a Lemax village display. A delightful Lemax miniature figurine that has been part of the collection since arrival in 2003. Chipmunks is a multi animal polyresin figurine piece mounted on a single snowed base to compliment your seasonal Lemax Village Seasonal display.